New UW peer reviewed paper on the 2010 Pakistan floods – nothing to do with "climate change " | Watts Up With That? 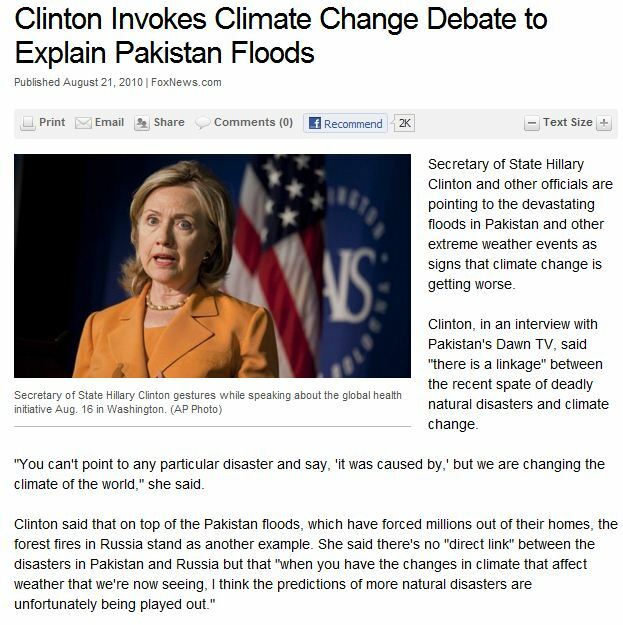 New UW peer reviewed paper on the 2010 Pakistan floods – nothing to do with "climate change "
Paging Joe Romm… Remember this ridiculous moment in climate politics last year? Well guess what kids, there’s a new peer reviewed paper to be published in the Bulletin of the American Meteorological Society, and in the press release about the paper, they don’t even mention the word “climate”. Simply put, a rogue storm system, part of the normal chaotic nature of weather on this planet, was the cause. Nothing else. Anyone who claims it was part of “climate change” is simply flat wrong, and that includes Hillary. This paper was presented today at the AMS meeting in Seattle. Last summer’s disastrous Pakistan floods that killed more than 2,000 people and left more than 20 million injured or homeless were caused by a rogue weather system that wandered hundreds of miles farther west than is normal for such systems, new research shows. Storm systems that bring widespread, long-lasting rain over eastern India and Bangladesh form over the Bay of Bengal, at the east edge of India, said Robert Houze, a University of Washington atmospheric sciences professor. But Pakistan, on the Arabian Sea west of India, is substantially more arid and its storms typically produce only locally heavy rainfall. The flooding began in July and at one point it was estimated that 20 percent of Pakistan’s total land area was under water. Structural damage was estimated at more than $4 billion, and the World Health Organization estimated that as many as 10 million people had to drink unsafe water. Houze and colleagues examined radar data from the Tropical Rainfall Measuring Mission satellite and were able to see that the rainfall that caused the Indus River in Pakistan to overflow was triggered over the Himalayas, within a storm system that had formed over the Bay of Bengal in late July and moved unusually far to the west. Because the rain clouds were within the moisture-laden storm from the east, they were able to pour abnormal amounts of rain on the barren mountainsides, which then ran into the Indus. The progress of the storm system stood out in the satellite radar data, Houze said. 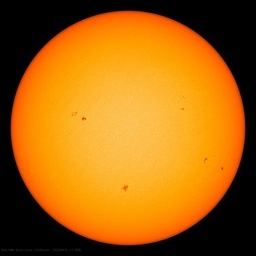 Houze is the lead author of a paper detailing the findings to be published in the Bulletin of the American Meteorological Society. Co-authors are Kristen Rasmussen, Socorro Medina and Stacy Brodzik of the UW and Ulrike Romatschke of the University of Vienna in Austria. The storms were associated with a wind pattern that could be traced in the satellite data back to its origin over the Bay of Bengal, Houze said. Finding the storm system’s signature in the satellite data makes it possible to incorporate that information into weather forecast models. That could make it possible for meteorologists to forecast when conditions are favorable for such an event to occur again and provide a warning. For more information, contact Houze at 206-543-6922 or houze@uw.edu. NOTE: The Tropical Rainfall Measuring Mission is a joint project of NASA and the Japan Aerospace Exploration Agency. Hillary and Gore……..let’s see if the POTUS makes any silly attributions tonight in his SOTU address. On second thought, you’ll have to let me know as I don’t think I can bear to watch it. The press release does not say the floods were unrelated to climate change. It discusses the immediate cause and does not address whether or not climate change may of contributed to the magnitude of flooding or increased the probability of the immediate cause. Can you point out just one competent person in the Obama administration? Just one……. So the storm itself was one of the normal monsoon storms that happen normally in that part of the world, but it happened farther west than normal. Monsoon rains can easily bring monthly totals to 1m per month. That amount of rain anywhere unusual would cause serious flooding. I know that 1998 (similar ocean pattern) produced tremendous flooding in Bangladesh. That country is designed for flooding. So that part of the world needs to be ready for flooding anytime an El Nino is switching to a La Nina. Great article – but I think there’s a typo in there. ‘Rouge storm systems’ sound like something you would only find at surrealclimate.com. Smart diplomacy… now every Pakistani who has lost family, friends, or property to the floods can hold a legitimate grudge against the people of the United States of America for being the responsible party for the floods. Smart diplomacy: how to make foreign friends and influence foreign people. She’d have done well to have left out the “we”, and simply stated that the climate changes constantly ever since water showed up on this rock. I think in the write-up (first paragraph) it should be “rogue storm system,” instead of “rouge storm system,” although I do see red when I see these things blamed on GW. The politicians spread their lies, one by one, two by two. Michele Bachmann will be giving her response after the official Republican response to the SOTU. I’m curious what she’ll say. Mike, that’s clear enough for me. Press release or peer reviewed paper, whichever one you mean, if they could even speculate that global warming was involved, they would have. Up to now, global warming was the assumed primary cause, and all else was secondary. That GW was not mentioned speaks volumes. It’s worth remembering that the Pakistani floods impacted Hillary so much that she generously gave $10 to the relief effort. She also paid over $3 million for her daughters wedding as a juxtaposition. Rogue storm caused by AGW. Six degrees of separation applies, every event is somehow connected to AGW. There can be no definitive statement about the rare flooding in Pakistan this past summer either way. It was a “rare” event, caused by “unusual” conditions and the only thing that can be said that if these kinds of “rare” events begin to happen more frequently over a longer period than just a few years, then some sort of climate change would be occurring (by definition). The next step would be to then identify the source of that longer term change– natural or anthropogenic. Certain elements from both sides of the AGW seem to want to try lay some sort of claim one way or another to these rare one-off events, when the only true scientific path is to track the frequency and intensitiy of “rare” events, as see if that frequency or intensity changes over time. This really doesn’t surprise anyone does it? Just another leftist parroting the religion of AGW. Mmmm, sure, because in science, we pick one paper that is the final word on a subject, because it fits in with our preconceptions, and all possible alternative views are henceforth considered untenable. Oh, and I forgot – obviously we wildly misinterpret that paper, to ensure that we think it supports our preconceptions. What is the necessary connection between climate (or in this case weather) alarmism and Progressive politicians? Is it because they must listen to some authority and they just happen to choose badly? or what? Well it only happened once; and hasn’t happened since; and hadn’t happened before. (in that locations) Ergo, it is just weather and not a climate change. If it WAS climate change or related to that, it would be happeneing all the time; just like global warming. Hillary Clinton choses her words very cautiously but even doing so, her implicit claim concerning disasters, if it were be right, how on earth could she possibly know? “Climate change” is such an empty word it can neither be the cause nor the result of anything. And if it were, H.C. would be in no position to perceive or understand. It just isn’t comprehensible, all simplistic reasoning – warmer planet means more moisture and more precipitation- cannot explain any distribution or intensity. It is just not “knowable” in the sense that it can be reduced to concepts that the human mind can comprehend. I am an economist and I know nobody can reduce the economic crisis nor the recovery, the currently continuing struggling of the Britisch economy and the German economic upturn to a causal relationship comprehensible to the human mind. If you accept this, the comments made by H.C. are both empty and irresponsible. And the most irritating and recurring idle reasoning is arguing that climate or climate change is affecting weather. It’s weather that defines climate, not the other way around, weather is a phenomenon a physical fact, something you can describe and measure in “space-time” and which “exists”, climate is an ill defined human abstraction that neither “prevails” nor “appears”. This is perfect politics. They don’t even have to prove it anymore. Where else would someone that could be wrong want to be. I just typed ‘weather disasters’ into an amazon.com books search and got 724 hits so I guess we must be having them all the time to generate that amount of literature. You beat me to it, and additionally it was the rapid transit from boy to girl that did this one. I know. I read it at Judy’s or somewhere. it looks like a hockey stick! Bit of a slow down since the year 2000 though. Change will come from the bottom. Expect politicians to be the last to change their rhetoric. PF, everything looks like up to me. And every day in every way, better and better. “Can you point out just one competent person in the Obama administration? Just one……. uhm, I think Bo is doing a pretty good job as first dog. ……..except that there are mice running uncontrolled thru the white house…. nevermind. Weather is NOT climate, except when someone wants to use it to prove that CO2 Climate Change is real. Lamentably, just because the Woman With One Eyebrow is blazingly wrong in this as in bloody everything else does not mean that the Red Party faction in Mordor-on-the-Potomac is to any significant extent right. Would it be worth inquiring of the readers here to suggest the names of individuals writing or speaking to this issue who have an accurate and therefore reliable take on the floods which Allah the Merciful has visited upon his righteously observant people in the staunchly Islamic nation of Pakistan? January 25, 2011 at 3:47 pm blah blah blah blah climate change blah blah. Well Mike, I have this to say. If CO2 or Climate change or climate disruption or global warming WAS blamed YOU would be over there with your mates at realclimate having a love in* over the fact it was mentioned. And the MSM would have front page headlines. They don’t, you lose. Anyway you try to spin it you lose. As it is you make ONE troll comment on every post here at wuwt you do not agree with and then never return to respond to questions. Well guess what? I will not read or respond to any further posts by you, unless I warn others about your trolling. Headline (for Mike): Flooding in Pakistan not caused by Global Warming. Peer reviewed paper says so. Go Back to your love in* Mike. Imagine that; a flood on a flood plain. Who would of thunk. The answer is not that hard to figure out. So the stated cause is not really the cause, just the immediate cause and not the underlying cause and if they don’t mention or address climate change as the underlying cause then it fair to claim that climate change is the real cause not the weather; like they claim. Stevo, there are many peer reviewed papers showing that AGW is non-existent or very very over stated in climate science. Yes Pat I agree. And when ordinary folk’s asses are frozen because they can’t afford to heat their houses then the changes will be rapid, dramatic, effective and permanent. ‘Let them eat cake’ seems to come to mind as a flash point statement that set the tumbrels a’rollin’ when the peasants were stressed. It might even need to come to that. Rogue storm system caused Pakistan floods that left millions homeless. Why humans should avoid living on flood plains, but always do! Flood plains hold the water for much longer due to the poor soil absorption and a naturally slow drainage angle of the valley/delta floor, thus the wide spread river overlapping of the banks during higher than normal river run off, which causing extensive flooding? See satellite map below! The Indus River is a major river, which flows through The Indus Valley; the full length of Pakistan and most of the area adjoining the river is a relatively flat flood plain/delta, with a huge population living in close proximity to the river. The total length of the river is 3,180 kilometers (1,976 miles) and it is Pakistan’s longest river. Storm systems that bring widespread, long-lasting rain over eastern India and Bangladesh form over the Bay of Bengal, at the east edge of India, The flooding began in July and at one point it was estimated that 20 percent of Pakistan’s total land area was under water. Basically it is an 18.03 year repeating pattern every 6558 days the lunar tides are the same and the same type of disturbance happens in the same areas on the surface of the Earth. Watch for a near repeat of the heat in Russia again this summer 27.32 X 12 (declinational cycles later)= 327.84 days later or about 37 days earlier in 2011. Then it will be ~18 years before the same pattern occurs again. Just looking back almost half of a cycle will not find anything naturally. This is why science is so hard for you. I’ll try to make it clear to you. If I say A causes B and you say C causes B we can both be right. They may both contribute to B or maybe A causes C which then causes B. A practical example: If I say our ageing population is contributing to out budget woes, and you say it is Social Security that it the problem we have not contradicted each other. I haven’t seen the study itself, so it may or may not mention climate change. But the results announced in the press release do not contradict claims by some scientists that AGW likely played a role in these floods. The people who do science go to college and then graduate school where they take courses in how to think logically because formal logical thinking is hard and unnatural for most people. These courses are often called by such names as Calculus or Linear Algebra or Statistics, but they are really about how to think clearly. I teach these courses. For those who lament the dumbness of hoomans living on flood plains (and volcanic slopes): it’s reeelly good farming, jeenyuses. Life is much more prosperous and easier, when you’re not being wiped out every generation or two. And then, after the flood or eruption, the farming is even BETTER! And lots of the competition is eliminated. Please, please, please stop using ‘Romm’ as if it were some celebrity, cartoon character, or even minor Roman emperor we might already have school days memory of. WHO? Mike, your numberz courses don’t, evidently, include anything covering the “Null Hypothesis”. See, that’s what you assume is the case unless strongly counter-indicated. In climate and weather, that MUST be that “this event is part of natural cycles and caused by non-anthropogenic forces.” Then you have to try sincerely and competently and inventively to prove that’s TRUE. Only if you fail with a high level of ‘confidence’, over and over, do you have a robust hypothesis. This has never, ever, been done by Climatologists with respect to any sliver or fraction of the AGW speculation. It isn’t even a respectable hypothesis, yet. 2010 = lot of precipitation yes, but nothing unheard of before. Simply put, a rogue storm system, part of the normal chaotic nature of weather on this planet, was the cause. Nothing else. Anyone who claims it was part of “climate change” is simply flat wrong, and that includes Hillary. She didn’t, she gave an explicit caveat; “You can’t point to any particular disaster and say, ‘it was caused by,’ but we are changing the climate of the world,” she said. and anyone who claims different is just an idiotic misrepresentation by a polemicist trying to push an agenda. I am interested to see you opine that disagreement with peer reviewed material makes a person “flat wrong”. Is this true of all peer reviewed publications, the dozen or so hockey sticks out there for example, or just those that support your point of view? I thought the Russian heatwave and Pakistani floods were the result of the same jet stream blocking thingy. If your comments on here are anything to go by, being taught clear thinking by you must be like being taught patient care by Drm Harold Shipman. Pakistan had worse floods in the 80’s, I forget which year, and before that probably every 30 years or so. Cyclic weather in a cyclic world. It is amazing how a person in high office and with a wide public profile as Mrs Clinton can come down so strongly and emphatically on the side of the global warming cult when there is so much doubt and corruption of the science that has been put out about it. She has obviously been got at by the likes of Trenberth, Hanson and Mann. She will certainly win the plaudits of the AGW fraternity, but I’m afraid she will very soon be looking back on her public proclamations with not a little embarrasment. I’m intrigued by the assertion that people who disagree with the peer reviewed literature are “simply flat wrong”. That statement serves as an admission of hypocrisy and alienates most of your readers. In this publication from the Canadian Meteorological and Oceanographic Society, Dr. Khandekar conclusively demonstrates how utterly wrong the mainstream media’s reports have been on the monsoon issue. I would say that Senator Clinton is very “courageous” in the YES MINISTER sense. Very few Ausie politicans or even scientists have been that brave, in claiming that the Australian floods were due to global what’s-the-name. The leader of the Greens was brave. He got promptly stood upon by both the government and oposition parties. Will somebody step on the lady? I doubt it because the USA political scene is rather more polite than ours Downunder. (That’s because we stand on our heads all day and so the blood can rush there too fast some times – that’s a scientific explanation for rude behaviour). Allowable hyperbole I would think. Fact remains that anyone blaming the floods on AGW was wrong to begin with. No single event can be laid at the door of climate change. It might be possible to prove statistically that the frequency of flooding had changed, but this gets increasingly difficult as the rareness of the event increases. How many years of data do you need to prove that a 1 in 200 year event has become a 1 in 100 year event? If you can do that, then you must also discount alternative reasons for the change in frequency. There’s been a drought in Amazonia. Is this AGW? Or is it due to the wholesale removal of rain forest (clue to its qualities in its name). The effect of floods grows annually anyway, because of people – more of them, in the wrong place, in poor-quality housing, removing forests in headwaters, straightening rivers & building flood defences & dams. In a world empty of people, would this storm have occurred? A question impossible to answer I suppose. The recent floods in Pakistan were due to global warming and a change in extreme weather conditions, which may cause more floods and droughts in the country in future, World Wide Fund for Nature (WWF) Pakistan Coordinator Nasir Panhwar has said. Last i saw they were claiming “Global Warming is causing this drought, and it’ll get worse and worse.” Instead, they had a flood. Now they claim “Global warming is causing droughts and floods and it’ll get worse and worse”. Has anyone seen one single model that accurately forecast any of these ‘AGW caused’ extrreme events? If so, could you please cite it? Allowable hyperbole I would think. On what grounds do you think this hyperbole is allowable? Bear in mind that this website would not exist if it was not accepted that people disagreeing with the peer reviewed literature can be correct. Fact remains that anyone blaming the floods on AGW was wrong to begin with. That was another interesting thing about the article. Hilarly Clinton didn’t blame the floods on AGW as is made clear by her caveat in the original Fox piece; “You can’t point to any particular disaster and say, ‘it was caused by,’ but we are changing the climate of the world,” The misrepresentation of her stance by both Fox and now Wattsupwiththat are part of a wider dogma attacking personalities rather than the science and is certainly not what I recognise as skeptical thinking. doesn’t really leave any doubt about what is meant: that this is another piece of evidence in favour of the hypothesis of AGW. The hyperbole would not be right in a scientific article, but in a blog I think you can let it slide. Can’t you? The problem with being a lap dog is you have to lick the heels of the owner of the lap you lie in. I do not blame Hillary for such stupidity – she was only doing what she was told to do by her master. Politics exacts a demanding price to those who seek the glory of power and prestige. The point is this: until one proves, with evidence, there is AGW, then one must assume there is not. That’s how I was taught science. There is no hint of anything about her wording, she used the correct form; we can’t attribute any one weather event to climate change, but we can attribute changes in weather patterns to climate change. It’s an example of a recurring meme on this very website; weather is not climate. The only reason it is being interpreted in in such a pejorative way is because it suits Fox’s, Watts’ and your ideological bias to do so. Given that changes in weather patterns are one of the predictions of AGW theory, it is another piece of evidence in favour of it. When that blog’s stock in trade is questioning the veracity of peer reviewed literature? No, either peer review is robust or it is not, but you can’t have it both ways, Peer review can’t be corrupt when it contradicts your view and unimpeachable when it doesn’t; that’s nothing more than confirmation bias and yet more evidence of the ideological bent of this blog. Wrong. Weather patterns always change. The Gobi desert is now only about 60 kM from Beijing. It has been moving that direction for hundreds of years. And crocodiles were found north of the Arctic circle, long before CO2 was emitted from the first SUV. Since “weather pattern” is such an unscientifically vague term, it suits the alarmist crowd well. But the only thing it indicates is that the climate always changes. Naturally. Now evidence is not proof. I would not claim there is a consensus that recent flooding is related to AGW, but there is evidence. One reason people might be having a hard time accepting the plausibility that AGW is causing an increase in extreme weather events is because we have only had 0.7C of warming. That does not seem like much. But that is only the warming of the surface temperatures. Most of the excess heat energy the Earth system has gained is in the oceans. Also warming is not uniform. So you have places where there has been a lot of warming of ocean water and this can lead to extreme precipitation events. Now, if you don’t believe GHG caused the oceans to warm, obviously you won’t agree the AGW is a factor in these extreme weather events. But then you are clearly operating well outside mainstream science. Wrong. Weather patterns always change. Can’t see how I can be wrong about this, given I never expressed any opinion on what weather patterns do or do not so historically. You tried to pull me up on something before, didn’t you, and you fell into a logical fallacy that time too, are you pathologically incapable of cogency? Rogue? LOL. Like a rogue elephant? Or Palin Gone Rogue? Is this a new term now introduced into the climate narrative? Well, the logical next step for the AGW gang will be to identify the cause of this “rogue” behavior, which must be a predictable symptom of irritable climate syndrome. I’m sure there must be some pill or therapy for that. Smokey and Al Gored and KD are right. You said: “we can attribute changes in weather patterns to climate change.” Not scientifically, you can’t. That’s only speculation. I agree that you don’t understand the null hypothesis and how it works. : If a new hypothesis can’t show there’s a difference, then the new hypothesis fails. There is no difference in the climate between pre-industrial co2 levels and the present climate with higher co2. The events you get so hyper about have always happened. It’s just natural climate variation. You believe they’re some kind of proof of cAGW? Well they’re not. They’re just normal and natural weather events. They happen now like they happened five hundred years ago or 2,500 years ago. Weather patterns naturally change over time, they always have. It’s OK, Kevin MacDonald is on vacation from his regular job. Can anybody explain to me why politicians in general and on this occasion Hillary Clinton in particular do not believe in published climate data that are being presented as “Official and correct”? The data I am talking about (or rather the reporting on the data) is that 2010 has just been proved to have TIED WITH 1998 as the hottest year since records began. Tied with, as far as I, and most people I know, understand it is the same as “a dead heat” in, say a marathon. – That must then mean that there was no other year (or years) between, or before the two that were hotter. I think there may have been some talk about 2005 coming very close, but very close is not good enough. It must then follow that there has been no “global warming” between 1998 and 2010. No Man made warming = no man made climate change = no man made solutions possible. From Climate Science: Roger Pielke Sr.
2010 Pakistan Floods: Climate Change or Natural Variability? Hillary Clinton is a politician not merely a scientist. What do scientist know about this ?(sarc). If it turns out that the politicians and the royal society are wrong about global warming and it starts getting clearly colder, will we get back all the money they have taken from us because of global warming. Usually the SW monsoon creates a lot of precip, without too much wind, and it happens from western srilanka, all the way to Gujarat in india, along the western shore. Bombay, for example, ( mumbai these days ) gets a constant rain, adding up to a lot. — like 80-90 inches per year. normally flooding kills a bunch of people. takes down a few willages. But it does not go up north as much as it did this time. Up north, until you reach punjab, so much of that area is like desert ( Tar desert is there ) . Ok, Kevin, so let’s talk a bit about logic. Given that you claim to teach college level statistics, algebra and the like I would first note that a GOOD professor would integrate logic into these sorts of courses. Far too many, however, do NOT and instead teach rote memorization – if even that these days. So your claim is suspect right off the bat. ….Given that changes in weather patterns are one of the predictions of AGW theory, it is another piece of evidence in favour of it…. So, gee, weather patterns during the transitions from interglacial to glacial periods prior to the existence of man on the face of the earth are therefor pieces of evidence in favor of AGW theory? Present day weather patterns that are completely within the historical norms prior to any significant man made emissions of CO2 are also evidence in favor of AGW? I hardly think so, and yet using your logic, this is exactly what you are claiming. Logical? Not. Good, college level formation of an argument, using logic to support your assertion? Not. I’m sorry, but logically of course you can have it both ways. You aren’t talking about a single instance of peer review. Peer review is done by many different people, by many different institutions. Like anything else done by man, there will be cases that are done quite well and others that fail miserably. Using any smidgen of logic, almost by definition peer review across the spectrum is both ways, robust and not robust. Peer review can’t be corrupt when it contradicts your view and unimpeachable when it doesn’t; that’s nothing more than confirmation bias and yet more evidence of the ideological bent of this blog. Here again, let’s check the logic of your statement. While it is unlikely, it is in fact entirely possible for there to be a situation(s) where peer review is corrupt when contradicting someone’s view and unimpeachable when it doesn’t. That’s almost beside the point, but I note it as another aspect of problems with your logic as you expressed it in these posts. More to the point, for your assertion to be logical, you would have to provide some evidence that this blog actually claims, without basis in fact, that peer review of climate related research supporting skeptical points of view is unimpeachable – and that peer review of AGW supporting research is corrupt. Frankly, I don’t think you have a chance of coming close to showing anything of the sort about this blog. If you want to assail others for supposed logical fallacies and so on, you might want to be more careful about your own statements. The ancient Indus Valley city of Mohenjo-Daro was somehow destroyed seven times by floods, all before 1700 BC and without the help of CO2 emissions. http://en.wikipedia.org/wiki/Mohenjo-daro . Smokey and Al Gored and KD are right. You said: “we can attribute changes in weather patterns to climate change.” Not scientifically, you can’t. That’s only speculation. No its not. Climate is the aggregate of weather, if the precipitation events (weather) increase then climate has changed and, similarly, if we see sustained, statistically significant changes in the frequency of other weather events then the climate has changed. That would not be speculation, it would be observation. If a new hypothesis can’t show there’s a difference, then the new hypothesis fails. When did I dispute this? I can’t post on these threads without facing a slew of straw man fallacies. No I don’t, such appeals to authority are generally unverifiable on-line and I don’t engage in them. Still, despite the fact you fabricate stuff I’m sure the Rational Debate moniker is well earned. My bad on the claim to teaching aspect of my post – clearly I attributed that claim from someone else’s post incorrectly to Kevin MacDonald. Nothing ‘fabricated,’ just an honest mix up in attribution from another post in this same thread. The rest of my post related to Kevin’s logic is, I believe still correctly referring to claims made by Kevin. Clearly he didn’t bother to address those aspects, even tho they were pretty clearly the most pertinent. My bad on the claim to teaching aspect of my post – clearly I attributed that claim from someone else’s post incorrectly to Kevin MacDonald. Nothing ‘fabricated,’ just an honest mix up in attribution from another post in this same thread. Incorrectly attributing facts seems to be the norm around here, so I wouldn’t worry too much about it. The rest of my post related to Kevin’s logic is, I believe still correctly referring to claims made by Kevin. Clearly he didn’t bother to address those aspects, even tho they were pretty clearly the most pertinent. Standard scientific method, a theory makes a prediction and if that prediction is realised it is considered a proof for the theory. You appear to be questioning the validity of the actual prediction which, whilst a perfectly fair point, is not the debate I’m having. Straw man fallacy. This is point you should take up with Anthony, not me, the terms of reference are his. If something is published and peer reviewed contradicting it is “flat wrong”, no ifs, no buts, that’s what it says in the article. So another straw man. The article featured in this blogpost does not contradict the theory that global warming will make severe floods more frequent. It merely outlines the weather mechanism that caused the recent Pakistani flood. The projection of more frequent floods and droughts is based on modeling the future. The article did not touch on this point at all. My comments related to your lack of logic, Kevin – an issue which you utterly fail to address and instead resort to misdirection. There were no straw men in my post, a bit of psychological projection on your part perhaps, as that’s the direction you promptly headed in your reply. Then I followed with a logical example showing your error. You ignored the point, jump to the examples, and proceed to claim that those examples, which you admit were accurate, aren’t what you were arguing. Only I never made claimed they were. On the contrary, I simply provided examples of how YOUR logic was flawed – and you have now agreed that those were accurate points, all while trying to pretend that I was talking about the specifics of those examples, rather than your logical failure which those examples demonstrate. Actually, Kevin, as an aside; standard scientific method is to propose a hypothesis, not a theory. Further, it takes a huge number of positive results and virtually no negative before a hypothesis comes close to being a theory. As to what the rest, as already noted of course I wasn’t questioning anything of the sort; you have apparently utterly missed the point I was making about your logical fallacy (or you got the point perfectly well, and simply chose to try to deflect and misdirect rather than admit error). Yes, I’ll say it’s a straw man alright – YOURS. Anthony makes no such statement in his article, and its really disingenuous for you to continue making this claim.